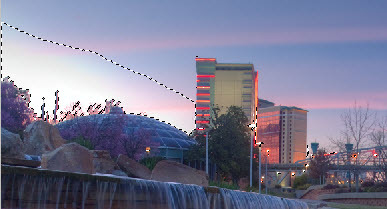 A while back, I posted a longer exposure photograph of a cascading fountain. 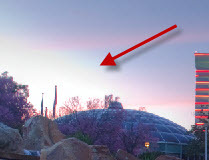 The photograph was taken in the waning minutes of dusk. It was a 20 second exposure with a filter, giving the photograph an impression of being taken with more available light than actual. The sun had set to the left of the composition, and ended up blowing out a little section of the sky with such a long exposure. I had some other exposures which handled the backlighting of the setting sun better, but I liked the tones and light in this one. So what to do? When highlights are “blown” or clipped, attempting to recover it fully can be a futile effort. 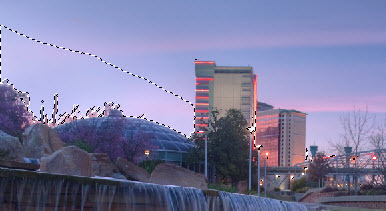 That was my understanding and experience until Michael Tuuk, another photogblogger tipped me off on using LAB mode in Adobe Photoshop to “paint” back what was lost. I gave it a try, and it was a photo saver, enough to post here to share. But here are a few key notes before I continue. Must have an editing program where you can work in LAB color mode or color space. I use Photoshop CS5. I remember it was available in CS3 & Cs4, but can’t confirm anything before or on any other image editing software. With this method, you can primarily recover color. Actual detail may still remain lost. Begin by bringing the photo into PS. I usually bounce my RAW files from Lightroom to PS, and therefore are set to a RGB 16-bit Channel Mode upon import. Switch to LAB Mode: Image > Mode > LAB Color. Note that you will want to do this first. If you have been working on an image and have used layer adjustments, there may be some conversion issues when switching modes. Duplicate the layer (for safekeeping). But since LAB is working in a larger color space, this now becomes possible. With your brush set to Color blend mode, all you have to now is paint back what has been lost once in LAB mode. My method for getting the paint color is to use the color picker and pull the closest color, and then paint. And that is really all there is to it. But that wouldn’t work for me in this photo. The sky is really in a gradient with pink and bluish graduating colors. So here is my added trick to the trick…adding a selection mask. Locate the channels window. In LAB mode, there will be four channels: Lab, Lightness, A, and B. 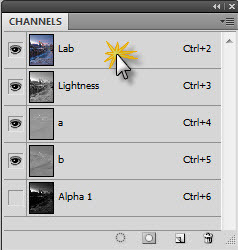 While holding the Ctrl button (or CMD), click the Lab channel. And then after I painted the color. This type of selection rocks because it is so specific plus it feathers. So essentially I’m making a drop cloth for the painting so I don’t have to worry about painting on the other areas. From here, it’s all “hit it and see what happens work.” With the selection and layer active, I painted with big, soft brushes with various color-picked hues until I was satisfied, and then deselected when finished. Conclusion: Sound exposure is always going to prevent the need for this tweak, or by bracketing to make sure the metering wasn’t fooled. But every now and then you might get one chance at something, and miss a bit. 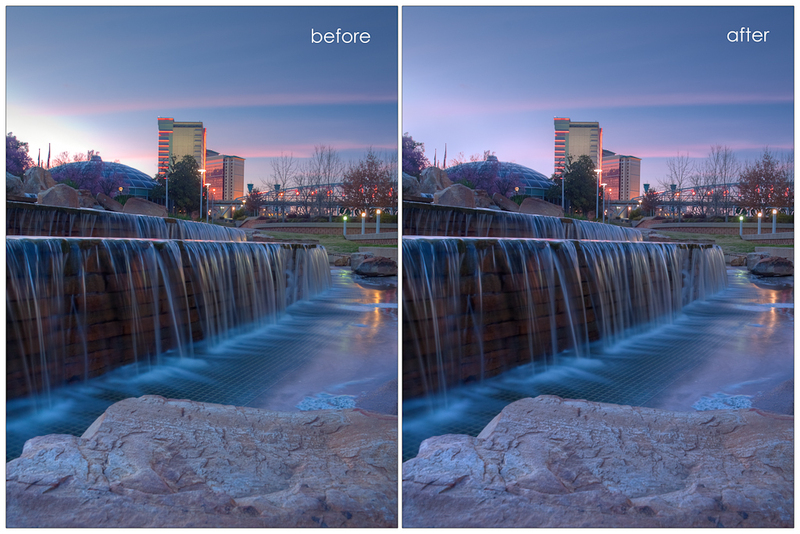 With long exposures in which the lighting changes in time, holding perfect exposure can be a challenge. If you blow out the entire sky, then no, this isn’t going to help. I have found it, though, to be an excellent remedy tool for that small area of highlights that are a bit distracting because they are blown. Thanks for posting this Brandon! After reading about it on your blog, I’ve been curious to see the details. Awesome, Brandon! I’ll have to try the selection mask thing too! Thank you for sharing this is very useful! I tried your method, found that the use Lightness channel, the effect will be better.